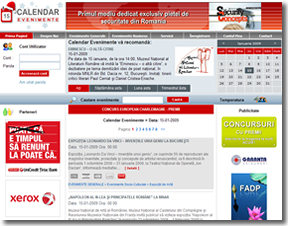 Calendar Evenimente is a project managed by Mastermind Communications S.R.L from Romania. The portal is the fastest growing community for local business and the Romanian press for posting events and news from corporate to political sectors as well as sports and cultural events that take place in Romania every day. Additional services include selling online tickets for the events that are promoted through the website.